1x 12 volt drill with long extension lead and battery clips. 1x 12 volt 13 watt light with lighter and battery fittings. Our windscreen repair kits are engineered here in Australia and tested under all Australian conditions. The Nano470 Windscreen Repair Kits, have proven to be an excellent work horse for any windscreen repair business. Simple and easy to use, producing excellent results. We supply a kit with or without a drill and the associated consumables. This is mainly for the Techs who want to upgrade their kit that have a drill. 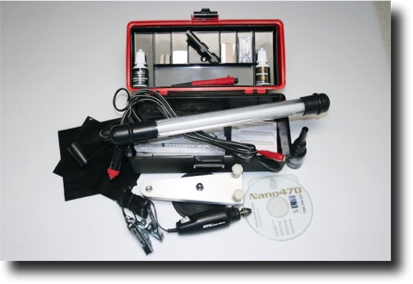 Nano470 Windscreen Repair Kit, operating under controlled conditions in a workshop, a customers garage or factory etc. Nano470 Windscreen Repair Kit operating out doors. There are a few special procedures you will need to follow working in the sunlight, even on a cloudy day.